(Nanowerk Spotlight) There is a physical and electrical disconnect between the world of electronics and the world of biology. Electronics tend to be rigid, operate using electrons, and are inherently two-dimensional. The brain, as a basis for comparison, is soft, operates using ions, and is three-dimensional. Researchers have therefore been looking to find different routes to create biocompatible devices that work well in wet environments like biological systems. In an exiting new development, researchers from North Carolina State University have fabricated a memory device that is soft, entirely based on liquid-based matter, and functions well in wet environments – opening the door to a new generation of biocompatible electronic devices. Reporting their work in the July 4, 2011 online edition of Advanced Materials "Towards All-Soft Matter Circuits: Prototypes of Quasi-Liquid Devices with Memristor Characteristics") a team led by Orlin Velev a professor, and Michael Dickey, an assistant professor, both in the Department of Chemical and Biomolecular Engineering at NC State, have demonstrated a memory device composed entirely of soft, squishy materials that operates in a wet environment. These properties are similar to those found in biological systems, including the brain. "Our work is a small step toward mimicking aspects of 'electronic' systems found in biology" Dickey tells Nanowerk. "In addition to having soft mechanical properties, our device displays memristor-like behavior." The 'on' and 'off' states of the device have memristor-like properties and depend on the ability to control the thickness, and thus, resistance of a thin oxide skin that forms on a liquid metal. Memristors are being pursued as next generation memory devices. They operate in a similar manner to synapse function in the brain (read more about memristors in our Nanowerk Spotlight "Nanotechnology's road to artificial brains"). 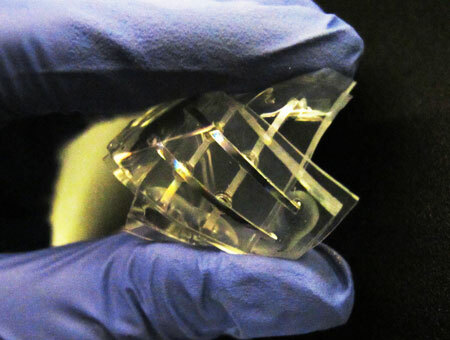 The device fabricated by the NC State team (that included graduate students Ju-Hee So and Hyung-Jun Koo, who also first-authored the paper) is composed primarily of water-based gels that are, in principle, compatible with biological species including cells, enzymes, proteins, and tissues and thus hold promise for interfacing electronics with biological systems. The novelty of this work is the operating mechanism of the memory device combined with the fact that it is built entirely from materials with properties similar to Jell-O. The memristor-like devices are simple to fabricate and basically consist of two liquid-metal electrodes that sandwich a slab of hydrogel. The memristor-like properties require asymmetry in the device. Dickey explains that, in order to achieve this asymmetry, they dope one side of the gel with a polymer that controls the interfacial properties of one electrode such that it is always conductive. The other electrode can be switched between a conductive ('on') and resistive ('off') state by controlling the thickness of the thin oxide layer that forms on the metal. "Our team had previous experience developing devices using gels, including diodes and photovoltaics, but the electrodes used in these systems were rigid" he says. "Initially, we sought to make these systems entirely soft by using liquid electrodes, but stumbled upon the fact that there was synergy between the gel and the liquid electrodes that could be harnessed to make interesting memory devices." It is important to note that these devices are not intended to compete with conventional memory devices, such as hard drives. Instead, they could be useful in environments that are hostile toward conventional electronics such as wet environments or applications that require bendable or deformable electronics. In particular, the biocompatible gels used in the NC State team's studies suggest that these systems may be well-suited for interfacing electronics with biology, e.g., biological sensors, medical monitoring or even artificial brain-mimicking or neuromorphic structures. Prototypes of the device have not yet been optimized to hold significant amounts of memory, but work well in wet environments. "Further research on the optimization and improvement of the prototype memristors could enable fabrication of high density three-dimensional soft circuits and in vivo operation of such devices" says Dickey. "We are currently studying the mechanistic details in more depth and also trying to interface the materials with biological species."